Sciblogs | How much dairying is too much in terms of water quality? How much dairying is too much in terms of water quality? Motu used a combined economics-land use model called LURNZ to project what land use changes are likely by 2020, driven by commodity process and knowledge of land use practices and landscape characteristics. Sheep and beef farming were expected to give way to dairying, forestry, and even reversion to shrubland. A team from AgResearch, Motu and Horizons Regional Council then assessed what mitigation measures would likely be adopted by 2020, such as wintering barns or artificial wetlands. In the end, they assumed that nutrient losses for a given area would remain about the same even as productivity increased – more intense production for the same environmental cost, what DairyNZ promotes as ‘holding the line’. The land use changes and increased agricultural efficiencies then fed into NIWA’s water quality model, CLUES. This produced projections of nitrogen and phosphorus yields based on land use and landscape characteristics. In general, based on the single scenario considered, phosphorus loads were expected to change little while nitrogen loads were expected to climb. 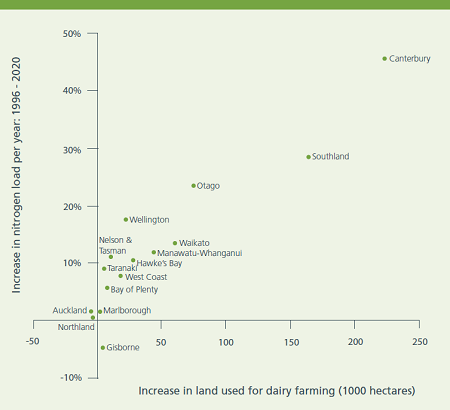 There was a roughly linear relationship between change in dairying area and change in annual nitrogen load. The report’s conclusion was simple: Anticipated expansion of dairying area would lead to increased nitrogen levels in our rivers and lakes, even with anticipated improved management. News of the report understandably precipitated a range of responses from the agricultural and freshwater communities. IrrigationNZ’s CEO Andrew Curtis dismissed the report as an unfair representation of recent land use management innovations. Canterbury and Lincoln University’s Professor Jenny Webster-Brown called the report a wake-up call, based on valid modelling and defensible assumptions. And these are but a fraction of the responses to the report, public and private. The report is a reminder that unless we significantly improve nutrient management in relation to dairy farming, and/or put limits to the extent of dairy farming, then water quality will degrade across New Zealand. The report was not a simulation of what will come to pass, but one of many possible scenarios. Management is of course improving (e.g., Horizon’s One Plan, Environment Canterbury’s proposed Land and Water Regional Plan, National Objectives Framework), and in time we’ll see their effects. But we cannot be sure how far technical and policy innovations will take us until it happens. Scenario-based modelling studies, like the PCE’s, are an insightful way of presenting alternative visions for New Zealand’s future, adding to the national conversation of where we wish to be heading. Another part of that conversation was put forward by Shaun Hendy and Paul Callaghan in their recent book, ‘Get Off the Grass’. Nations never get rich through agriculture, they say, so we should diversify our portfolio of economic earners. And setting water quality limits at the national and local scale is yet another part of the conversation being held to answer how much dairying, and intensive land use in general, is too much. I’ve seen much of what I call over reaction. Modelling exercise are good for pondering, perhaps good for considering future behaviours. I think a great tool for collaborating in attempt to paint a different future. Sadly models prove nothing. And if they are used as a tool to bully, a defence is easy to present. Personally, I am saddened with Fish and Games response. They have used this report as a political tool. As a paying member, I would have preferred they used it as a catalyst to working together with farmers for a better future. Not bash and bully as I read it. All that has done is create a greater distance between the groups involved. I tend to agree with Shaun Hendy and the late Sir Paul… The tech sector in general, and IT in specific offer us a prosperous future with smart people providing value by solving difficult problems… that don’t involve mending fences, worrying about snow and drought (to the same extent) and milk sheds at 4am. Unlike dairy, IT scales very well without commensurate environmental impact… and our exports are a) weightless (they don’t require fossil fuel-based export systems – they use the Internet) and b) they’re not supremely vulnerable to either a food safety scare or, imagine this, the fickle market deciding that dairy’s not cool any more (after all, a large proportion of people of asian descent are lactose intolerant). Let’s focus on the *fastest growing* export market, which is set to exceed dairy in the next few years given the rate of growth it’s sustained for quite a few years now. Dairy should be viewed as an economic stepping stone, not a grim inevitability for NZ, and it should be capped and then gradually reduced by attrition as higher-value tech industries pick up the export slack. And, for the record, I’m livid at the dairy-related degredation to Canterbury’s water supply. Dairy farmers are sailing close to the wind, so they say, and yet they still saddling the broader economy with huge externalities which almost certainly can’t be justified by any economic argument here in Cant’y. Shameful. The main offenders should be destocking now.